The purpose of this special edition is to provide a practical reference guide for individuals and units to use in preparation for missions as trainers and advisors to foreign military units. The publication includes tactics, techniques, and procedures successfully used by both United States Army special operations forces (SOF) and conventional forces in conducting foreign military training (FMT). 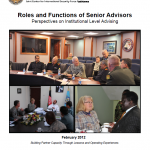 The final section of the special edition is an explanation of the security assistance process and includes the organizations involved in planning and resourcing foreign training missions and their respective responsibilities.